Park Cities Publishing, 9780996853835, 328pp. 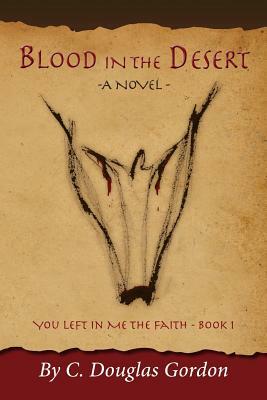 Blood in the Desert - A Novel Series: You Left in Me the Faith - Book 1 A brutal Roman soldier. A Christian slave girl. Their child. What could go wrong? Life is raw and cruel for the followers of Yesua in 294 AD. A relentless Roman Empire devoted to torturing and killing Christians leaves young Miriam enslaved to the ruthless army officer Quintus after the brutal murder of her martyred parents. As she grows into womanhood in his household, she endures the shame of bearing his child, a heartache that becomes unbearable when the baby, Philip, is born blind. In a fit of rage, Quintus drives mother and child apart and casts them on separate paths. As they each drift aimlessly to their fate, the mysterious wolf Lupa appears to lead Miriam, while young Philip is taken in by nomadic traders. Follow the riveting tale of their dramatic journey through the treacherous devotions of early Christendom in the days before the Emperor Constantine finds a powerful ally in Yesua and changes the course of history. Author: C. Douglas Gordon Book Title: Blood in the Desert Category: Historical Fiction ISBN-13: 978-0996853835 Publisher: Park Cities Publishing. C. Douglas Gordon Doug Gordon's writing journey began with an idea inspired by the faith of his older brother, Michael, now deceased. He kept his work to himself for quite some time, and then reluctantly showed it to some family members who were a little skeptical - until they began reading. When his daughter elicited a promise from him to keep writing, he threw himself into the research and study necessary to meet his own standards of excellence. In business, Doug's leadership experience required the ability to conceptualize projects, raise capital and build diverse teams serving complex client needs in multiple locations. His organizational experience includes extensive work in change management and process re-engineering. All of these traits have served him well in the transition from business leader to writing. Following a successful business career, Dallas architect and educator C. Douglas Gordon has returned to his passion for the history of religions. He is currently writing historical fiction set in the treacherous and exciting days of early Christianity. A product of five years of research and writing, Blood in the Desert is the first novel in his You Left in Me the Faith series.